4. It is pertinent to note here that this committee has been constituted at a time when large scale transformation is on the anvil in the rural post offices, with rural information and communication Technology (RICT) and post Bank of India (PBI) to be rolled out shortly. 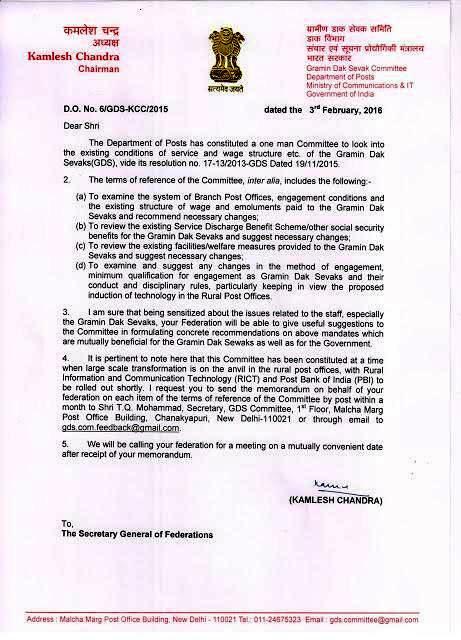 I request you to send the memorandum on behalf of your federation on each item of the terms of reference of the Committee by post within a month to shri T.Q.Mohammad, Secretary, GDS Committee, 1st Floor, Malcha Marg Post Office Building, Chanakyapuri, New Delhi – 110021 or through email to gds com.feedback@gamil.com.